Design based on Burgess’s scheme derived from models tested in Stevens Institute towing-tank during partnership work with Olin Stephens; final design has elements of both men’s ideas; design lines established by August, 1936; keel laid December, 1936; cost $500,000; steel hull, flush riveted; heat-treated steel rod shrouds; translucent bakelite deck inserts; lost mast on delivery cruise off Cape Cod; replaced with new in 21 days; used wheel, rigging and sails salvaged from Rainbow and Enterprise (same No. 1 main was used on all three); Launched May 11, 1937; Bath Iron Works Hull # 172; built at cost; funded solely by Vanderbilt; named for US frigate Ranger commanded by John Paul Jones; largest displacement J-Class; Hauled at end of 1937 and never sailed again. Sold for scrap May, 1941, bringing $12,000. 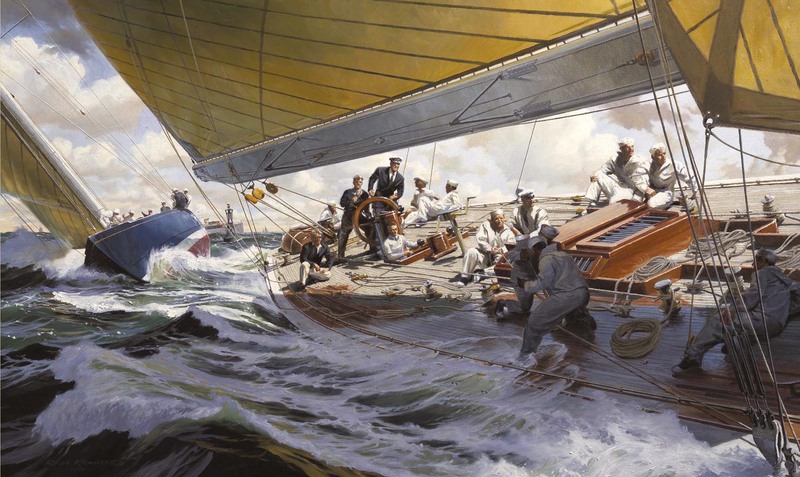 This original painting was first shown at Russ Kramer’s one-man show at the Museum of Yachting in August and then at the 2006 Mystic International exhibition in September at the Maritime Gallery at Mystic Seaport – where it sold into private collection on opening night.